I was fortunate enough to be the recipient of a BSP International Training and Fieldwork Award, which enabled me to travel to Brazil recently to perform further studies on the serology of Trypanosoma cruzi in domestic and silvatic animals to identify natural reservoirs of this parasite. The protozoan T. cruzi is the agent of Chagas disease, which remains a major public health issue in the endemic regions of Latin America. T. cruzi is transmitted through the faeces of the domicile-infesting triatomine bug vector, but other routes, including congenital transmission, contaminated blood or organ donation, and oral infection by contaminated foodstuffs, also exist. Approximately 8 million people are currently infected, with over 10,000 deaths per annum. The species T. cruzi is currently divided into 6 genetic lineages; the link between infecting lineage(s) and clinical outcome – death or debilitation due to cardiac and/or gastrointestinal pathologies in approximately one third of life-long chronic infections – is poorly understood. It is often not possible to obtain isolates from which to perform direct genotyping to identify lineage. The more indirect approach of lineage-specific serology has recently been developed in our research group at LSHTM, and had hither-to only been applied to samples from chagasic patients. Thus the BSP International Training and Fieldwork Award enabled me to travel to Brazil and extend this serological technique for the first time to samples from domestic and silvatic animals known or suspected to be infected by T. cruzi, originating from various parts of that country. Mammal reservoirs of T. cruzi lineages are of great importance to the control of Chagas disease as triatomine bugs feeding on them may also infest houses, and these bugs can be inadvertently consumed in beverages prepared in open conditions. In addition, the award was to allow me to have my first experience of sample collection in the field overseas, away from a lab situation. I spent nearly 3 weeks in Brazil, taking with me from the UK the crucial reagents and equipment to perform the work, a ‘lab-in-a-suitcase’ packed with plasticware, pipettes, and a cold box. Following the overnight flight from Heathrow, I made a brief visit to Goiânia in central Brazil to see a collaborating research group working on Chagasic patient samples. Then, onwards to the city of Rio de Janeiro for the bulk of my trip. 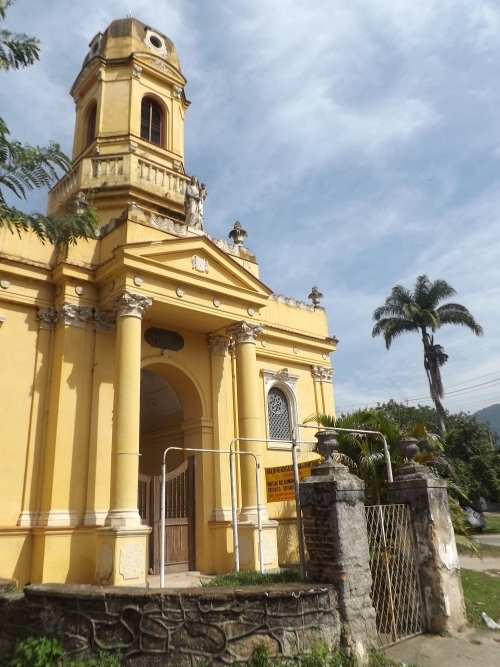 The work took place at A Fundação Oswaldo Cruz (FIOCruz), a biomedical research institute located in the Manguinhos region in the north of the city. The host lab has a great archive of sera collected from many classes of mammals collected in various biomes in Brazil, and I was able to test the T. cruzi lineage-specific serology for the first time on such samples. The technique uses lineage-specific synthetic peptides derived in our lab at LSHTM in an ELISA format. Fortunately during my time there I was able to achieve some preliminary, promising results, and also transfer the technology to the host lab, encouraging further expansion of this technique to a broader range of samples. In addition to the labwork, I visited a campus of FIOCruz located in the suburb of Jacarepaguá about an hour’s drive away from Manguinhos, situated in the Mata Atlântica (Atlantic forest), where fieldwork activities take place. In this area are found a number of suspected natural mammalian reservoirs of T. cruzi, and so these animals are sampled for evidence of infection by this and other pathogens. Tomohawk and Sherman traps are baited with foodstuffs to attract animals and are placed on the forest floor, and as shown in the picture I was able to participate in this activity. 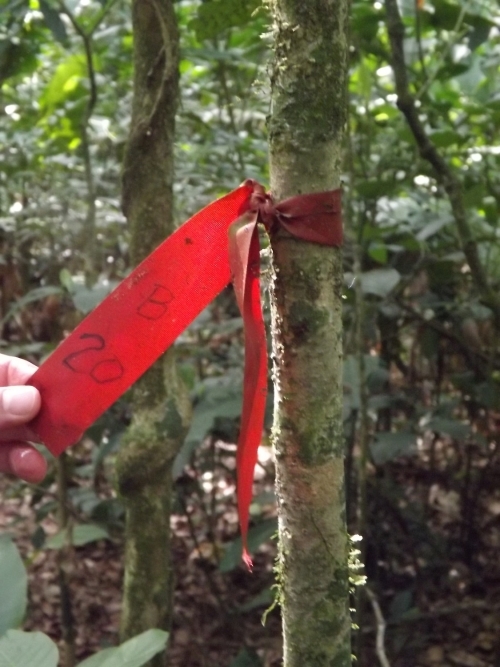 The location of the traps is indicated by red ribbons tied to nearby trees (see photo). There was quite dense leaf litter on the forest floor, so I was advised to watch out for snakes hidden in the undergrowth! This, plus the constant risk of tripping over vines and branches and being out in the tropical sun, gave a real sense of being out in the field and away from the lab environment. It also gave me a deeper understanding of the amount of effort needed to obtain the samples and thus a greater commitment to the success of the work done with them. The research station itself is located next to a colony originally built to provide humane treatment for people with certain disorders, and some buildings such as the church remain (see photo). This was also a very interesting insight into past care regimes in this part of Brazil, which I had not expected to find. I thoroughly enjoyed my experience in Brazil, a county preparing to host the World Cup and Olympic Games soon. Rio de Janeiro is known as ‘a cidade maravilhosa’, or the marvellous city, for good reason, although the prevalence and extent of the favelas also leaves its impression. Another important part of the visit was to experience some of the daily life of thecariocas (Rio’s inhabitants), including travelling on the city bus network and the metro system, as well as trying to speak Portuguese. I had studied some of the language beforehand, and after a hesitant first few days, gradually was able to understand and speak the language better, which was appreciated by my Brazilian colleagues who were very patient of my spontaneous grammar rules and vocabulary! After a while I realised that the word ‘Hee-oo’ which I had been hearing is in fact the Brazilian Portuguese pronunciation of ‘Rio’. I am extremely grateful to the BSP for the International Training and Fieldwork Award, as it has enabled me to gain my first experience of sample collection in the field, and in terms of the lab research, has led to promising, preliminary, data, which we plan to extend further. 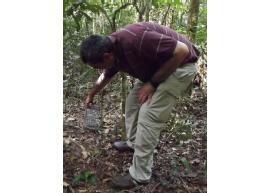 Several BSP student members have recently benefitted from the BSP International Training and Fieldwork awards. For further details please see the link.